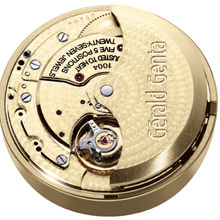 The newcomer to the Gérald Genta boutiques is a swinging Gefica model that catches the jazz beat in a limited edition of 50. The second watch produced exclusively for the Gérald Genta boutiques in Geneva, Paris, Hong Kong and Shanghai adopts the “blue note” introduced in the first. A distinctively expressive feature of Afro-American music, the tone is ideally suited to the Gefica, born in Africa from the dream of three friends with a passion for wildlife adventures. The fascinating blue shade of the dial and the alligator leather strap adds a decidedly hip touch to the bronze and titanium construction. 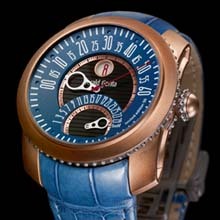 At its birth in 1988, the Gefica was entirely sculpted from bronze, a primitive material unknown in watchmaking. Chosen for its natural matt appearance, bronze also features the property of acquiring a unique patina over time and of enjoying a life of its own on the wrist of the watch owner. This charm is as potent as ever in the new Gefica launched in 2007 and distinguished by beaded titanium rings surrounding the case middle and the crown. Its flared case, extending from 42.5 mm in diameter on the wrist to 46.5 mm on the surface, is suited to a wide range of wearers. Its dial dips towards the centre via a concave outer ring with a curved central seconds hand gliding over it. At the heart of this complex structure lie a favourite Genta combination of functions: jumping hours along with retrograde minutes and date. These complications are driven by the self-winding Biretro movement in this horological creation enhanced by the concentric circular graining and Potter finish (old gold colour) that can be admired through the sapphire crystal case-back.